So today they have asked me to speak, to inaugurate the upcoming Kirtan Mela. 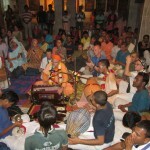 This evening there will be the adhivas ceremony of the Kirtan Mela and then after that kirtan will actually begin. So in a sense today is the first day of the Kirtan Mela and, somehow or other, this year our Sacinandana Swami, who has been the M.C for the last few years, wasn’t able to come. And then they asked me to take over as the M.C. That’s why they asked me to give this lecture. That’s how it happened. I chose two verses from the Caitanya Caritamrta, which Srila Prabhupada has combined in one translation. There’s only one on the board of the two so I will first chant the first one that’s not on the board and then we can together chant the second one. Translation: The characteristics of Krsna are understood to be a storehouse of transcendental love. Although that storehouse of love certainly came with Krsna when He was present, it was sealed. But when Sri Caitanya Mahaprabhu came with His associates of the Pañca-tattva, they broke the seal and plundered the storehouse to taste transcendental love of Krsna. The more they tasted it, the more their thirst for it grew. So it is described how the Panca Tattva broke the seal of the store house of love of God and then they began to drink these fruits of love of God and as they were drinking their thirst was increasing. So I thought that was the proper theme for the Kirtan Mela because I thought that’s indeed what we have come to do. We are coming amongst ourselves. We are particularly chanting amongst each other just like Sri Caitanya Mahaprabhu was chanting along with His associates in the house of Srivasa Thakur. And how no outsiders would be allowed in and how the devotees would just chant the entire night and become deeply absorbed, deeply absorbed in chanting and dancing. And as we see, by drinking this transcendental sound, by engaging in this glorification of the Supreme Lord their eagerness, their thirst increased. So really, if we think, that is the meaning of our gathering here. It is a big celebration. It is a festival. We are certainly getting ready for celebrating the glories of the Supreme Personality of Godhead. I am recalling how the Panca Tattva was brought into the project, how the installation took place, and I remember how afterwards, so many Vaisnavas were interviewed as to what they thought would happen next. And we can see; now it is unfolding what is happening next. The temple of the Panca Tattva is now coming up. We are now chanting before the Panca Tattva. We begin our worship here, in Sri Dhama Mayapur, of the Supreme Lord in His most merciful form. We need that mercy. Somehow or other, from here in Mayapur, Krsna consciousness spread all over the entire world. Srila Prabhupada distributed the holy name to every town and village and, somehow or other, it also reached wherever our residence, wherever we lived. I remember in my town this grey van pulled into the town one day. It had a flap door at the back and many, many pink men came out. Too many, if you know what I mean! (laughter) Too many for one van and I thought that possibly they were not from this planet (laughter). When they made a line and came in my direction in the street, I quickly went into a shop and stared from behind the glass. Someone said it’s a dangerous sect. they certainly looked dangerous as far as I could see. But somehow or other this holy name came into our sinful places, in the middle of our sinful lives and changed everything around. And amazing enough here we are in this sacred abode. It is very interesting. It is said that the spiritual world is known as the tripad vibhuti or three quarters of the total manifestation and the material world is ekapad vibhuti, one quarter. So, somehow or other, Krsna made this arrangement; Krsna arranged it that there was mercy for those living beings who came into this material world, those living beings who somehow or other turned away from Krsna. Krsna arranged for them a place to stay, a place where they could lord it over, a place where they could try to enjoy. Although, Krsna also arranged for a little sand in the sweet rice, some suffering in the material world because He couldn’t wait, because of His desire for all living beings to return back, back to home, back to Godhead. But still, anadi bahirmukhe, the living beings are since time immemorial in the material world and practically nitya baddha, practically eternally fallen. When oh when will they finally return? Therefore the Lord made His arrangements. He thought, ‘Let Me give them some mercy.’ Then He thought, ‘Why would I give them some mercy? I give them all the mercy,’ and He arranged for the entire spiritual world to be present within the material world. It is here in this transcendental spiritual world, which is covered only with a slight layer of yogamaya, that we are assembling and that we are now performing, about to perform, this Kirtan Mela. Kirtan Melas have caught on after the inspiration of Aindra Prabhu. So much kirtan came up (during) and (also) after he left. Kirtan Mela became like a wave that washed over the world. Everywhere Kirtan Melas are sprouting up and still more are happening. But it’s clear that this is the original Kirtan Mela. This is the place more than any other place because here the mercy is so much greater. It is stated that we are covered by lust, which is burning in the heart like fire, and then in the next verse it is identified where this lust is situated namely it says, indriyani mano buddhir asyadhisthanam ucyate (BG 3.40), in the senses, in the mind and in the intelligence.And in this way we are not able to fully penetrate. Nonetheless here in this dhama the Lord is revealing Himself very quickly. It is said that due to having interacted with the material energy for many many lifetimes, so many karmic reactions are stored within the heart. So this aprarabhda karma, these unmanifest karmic reactions, are stored within the heart and the result of that, of that stock of sinful reactions within the heart, is the sinful inclination. And it is for that reason that again and again we are attracted to the material energy. And it is for that reason that in the beginning, Srila Visvanatha Cakravarti Thakur says, in the beginning spiritual life is localised in the material influences (that are) all-pervading and everywhere. So in this way we are experiencing. And due to that sinful inclination, offensive behavior comes natural to us. It is mentioned that in the matter of chanting of the holy name according to Padma Purana, if one wants to achieve the success of that chanting then one must avoid the ten offenses. It is not that we are sometimes accidentally slipping into one of these offenses. Practically it has become our second nature, like finding fault and criticizing, (for) anyone and everyone is easy. Glorifying (is) much more difficult at this stage. So we can understand that still some of that impurity remains. Therefore, for most of us the chanting is a process of purification, ceto darpana marjanam, purifying the heart and purifying the urifying the senses, purifying the mind, purifying the intelligence. senses, purifying the mind, purifying the intelligence. It is here, through that purification, that we get our strength. It is krsna-sakti vina nahe tara pravartana (CC Antya 7.11), without being empowered by Krsna no one can preach Krsna consciousness. So it is the mercy of the Panca Tattva, that the Panca Tattva very quickly overlooks offenses, and therefore quickly gives us the taste. Srila Prabhupada explains in the introduction to the Nectar of Devotion that nothing moves without taste. It is very difficult to do anything very long without taste. Chanting 16 rounds (is) difficult without taste,(just) out of duty. (It’s) difficult without taste. So, somehow or other, by chanting the holy name taste will awaken. Spiritual strength will come automatically. After all, there is no doubt that Krsna is all attractive. The meaning of His name is all attractive and therefore Krsna will attract. It is not, ‘Will it work or will it not work.’ There is a verse in the Tenth Canto which begins with the word, jayati jana-nivaso (SB 10.90.48), and it says that jana-nivaso, the shelter of all living beings, jayati, is victorious. Visvanatha Cakravarti Thakur commented on that and said ‘is victorious’ means present tense because there is no question, ‘Will the Lord be victorious? Will it work (or) will it not work?’ It always works. It is working whether we notice it or not. Whenever we are engaged in devotional service to the Supreme Lord, and specifically the chanting of the holy name as the most important limb of bhakti, then surely, surely that name will act. Although in the beginning we may still practice chanting in the mood of a sadhana, in the mood of a practice, where we have to push ourselves. It is something like a river with a strong current or an ocean with a current, on the side the current is not so strong but if you go deeper into the water then the current will grab you and drag you along. So in that way it is also (like that) with the chanting of the holy name. In the beginning we sort of push ourselves to chant but then we become captured and dragged along. It is, it is addictive. Once these Kirtan Melas have started, they created a momentum and now its something that will not stop. It will carry on and it is clearly an arrangement, an arrangement that we take some time to chant ourselves and that we take some time to really become absorbed. So the Kirtan Mela is not just another new feature of the festival, some form of transcendental entertainment, where we get the best singers and it’s going to be a great party. It’s more than a great party. It is also, in a sense, a retreat. It is also, in a sense, an opportunity to make a special endeavor to chant. Therefore part of the concept is to, to get into it. Not just to walk in and out (or) stand on the side and listen a bit but to actually sit down, to sit down and to allow the mind to become captured and to become absorbed and to actually chant for many hours at a time. That is the idea, as Sri Caitanya Mahaprabhu did with His associates. Such kirtans easily (lasted) eight hours, throughout the night and everyone (was)constantly chanting. How voices lasted? How bodies worked? It is only possible by taste. We see in the descriptions of the Caitanya Bhagavata, in the descriptions of the kirtan that the main dancers in these kirtans were, somehow or other, Haridas Thakur, and Advaita Acarya – the old folks. They were old; Advaita Acarya was like 53 years older than Sri Caitanya Mahaprabhu. So he was very old. Haridas Thakur (was) approximately some 35 years older. (He was) also old. They were the elders (and) they were dancing. They were the dancers. So that is only possible when one becomes captured, when one appreciates the glories of Krsna and when one has committed himself in service to Krsna. Srila Prabhupada mentions, further in the Nectar of Devotion, he mentioned that the ceto darpanam marjanam, the cleansing of the heart cannot really take place unless we cooperate by adopting a service attitude. It is that commitment that makes the difference. It’s not that the holy name is only sheer magic and we are just sort of passively immersing ourselves in this magic mantra that will change everything, and I am waiting for it to happen. No, it will change things to a point where one’s service attitude awakens and where we take that up. So it goes hand in hand with commitment and we are seeing this commitment, commitment in service; Advaita Acarya had taken up, even before the appearance of Sri Caitanya Mahaprabhu, the mission to explain the Bhagavad Gita in the personalist understanding. He actually had this commitment to explain the Gita (gitera satyera path) or to explain the true meaning of the Gita or the Bhagavad Gita as it is. We can see. So Advaita Acarya had committed himself to that, to gitera satyera path, to explain the Bhagavad Gita as it is and sometimes with difficulty. But Sri Caitanya Mahaprabhu appeared sometimes in his dream and would instruct him and in that way, when he got stuck he would get… Like in the Thirteenth Chapter of the Bhagavad Gita there is a verse which says the Lord has many faces, many arms and so on and Advaita Acarya was breaking his head, ‘how do I explain this in a personal way?’ Sri Caitanya Mahaprabhu came in his dream and explained, it is the Paramatma who is present within the heart of every living being and therefore many faces, many arms, many feet. Oh! It is said that Srivasa Thakur in his earlier life was not exactly living the life of a devotee. Caitanya Chandrodaya Natak of Kavi Karnapurna describes how Srivasa sort of lived the party life for some time. But then from some source there was a prediction that he would die within a year and he believed it. So that changed his life considerably and he took up devotional service. Then when that particular day was due, the day that he was meant to die, that day he went to house of Devananda Pandita who was lecturing on the Srimad Bhagavatam and the lecture was upstairs in the house. And during the lecture, Srivasa felt suddenly that he was suffocating. He was choking. He needed air. So he went outside on the balcony and as he was on the balcony he became overwhelmed by a fit of dizziness and a result he fell right over the edge of the balcony. And then, somehow or other, just before he hit the ground, some personality appeared from nowhere and caught him midair, put him on the ground and he left. And that became his inspiration, that became his inspiration to start kirtan in his house, in preparation of the appearance of Sri Caitanya Mahaprabu, although everyone said he was mad for doing such a thing. He was deeply inspired and he took up this mission. Then when Caitanya Mahaprabhu came this mission reached its peak. For us that same, same miracle happened through the via media of Srila Prabhupada who came, who came chanted in Matchless Gift, chanted in Tompkins Square Park. Now in Tompkins Square Park there is that tree and there is a sign and in the tree it’s mentioned,” This is the Hare Krsna Tree” and at the side of the pathway there is an explanation, that the Founder of the International Society for Krsna Consciousness, His Divine Grace A C Bhaktivedanta Swami Prabhupada, here started his preaching in the West and started his international society and then the movement spread all over the world from this place. “Can I ask you a question? I said, “Yes of course! I sort of like, you know, I could see that Srila Prabhupada just transformed that tree into a desire tree (laughter) and whatever you prayed for, it just gets fulfilled, right. So that was quite something, quite something. So we are here now by that mercy of Srila Prabhupada. He brought us here and therefore we begin our Kirtan Mela with a prayer to his lotus feet. Prabhupada made it still more accessible to us. Prabhupada made it still more easy to somehow or other take to Krsna consciousness and patiently brought us up. And now we have come here, clearly by an arrangement and a plan of the Panca Tattva, clearly by an arrangement and a plan of the Supreme Lord to chant Hare Krsna. Just like it was His arrangement when He was here five hundred years ago that the devotees would chant in Srivasa Angam and in that way, yata yata piye, trsna badhe anuksana. By chanting, by drinking this transcendental sound that taste would increase and increase and increase and may the same happen to us, may that happen in this Kirtan Mela. May our thirst increase and increase so that we develop great eagerness to chant again and again and again everywhere because that’s how Krsna consciousness actually spread. So taking all that in consideration yes I hope that a little bit of this verse will manifest in my heart, yata yata piye, trsna badhe anuksana. 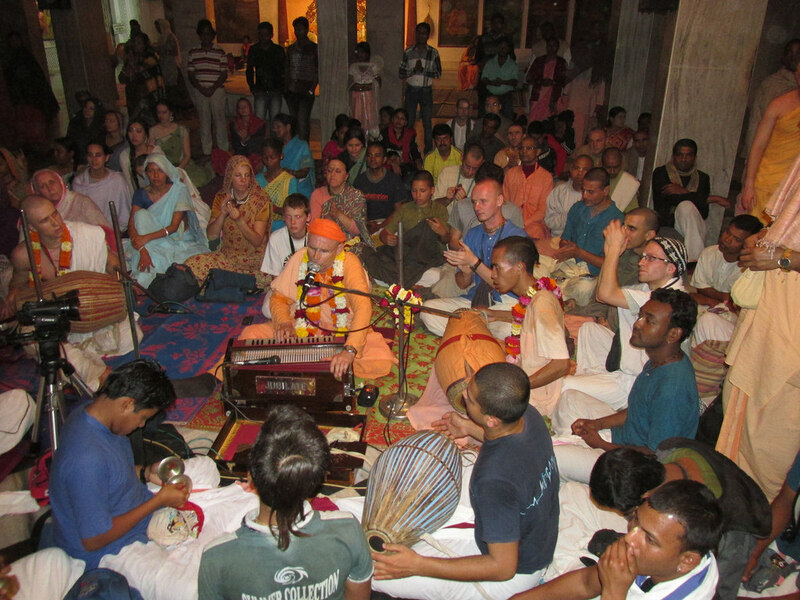 Now kirtan is an amazing thing because in kirtan we are chanting together and it is said (Srila Bhaktivinoda Thakur makes this point, Srila Prabhupada also echoes it) that a pure devotee should lead the kirtan. One should hear kirtan from a devotee. Otherwise one should not hear. One should hear a pure devotee, (he) should lead the kirtan. And that devotee he will lend us some of his taste, of his thirst, of his eagerness, of his bhava. That’s how it works. In the Nectar of Devotion this is described as chaya bhava, the shadow reflection. So it is said that from a Vaisnava one can borrow. One can get some ecstasy. It’s said (that) from the dhama one can also borrow some ecstasy. So two times here we can borrow some ecstasy, and in that way accept. Then by continuing our practice ourselves, some of that ecstasy can also grow root within our heart and remain permanent. Devotee: Jai Maharaj. Thank you very much for a nice class. I have one question. It’s about Srivasa Thakur. You said that before he had a party life but it’s said that he is expansion of Narada Muni. I am thinking, how come if he was expansion of Narada Muni he was before in a party life. HH Kadamba Kanana Swami: So the question (that)is I referred to Caitanya Chandrodaya Natak, to the narration of Srivasa Thakur, and in the early part of his life (he was)not exactly living the lifestyle of a devotee. However, we have heard that Srivasa Thakur is none other than Narada Muni. So how is this possible that he would not have lived the life of a devotee? It is certainly not possible that Narada Muni would have lost his Krsna consciousness. That cannot be. But it is only possible by the arrangement of the Supreme Personality of Godhead. So we can understand that when Srivasa was acting in this way it was orchestrated by the Supreme Lord. Just as Arjuna was sort of bewildered by the arrangement of the Lord, in the same way Srivasa Thakur was bewildered by an arrangement of the Supreme Lord. Interesting, because by that arrangement we can identify much easier with Srivasa Thakur as a role model. Because we also were not always practicing Krsna consciousness. But anyway, when Srivasa fell and when he was caught midair, that’s when this Narada sakti began to manifest in him and it began to fully blossom when he read that verse, harer nama harer nama harer namaiva kevalam, like that. Hare Krsna! Hari Sauri das: Hare Krsna. First of all thank you very much for a really wonderful and inspiring class. It was excellent. It did remind me of when Prabhupada was here in 1976 and just a day or two days after the Gaura Purnima festival most of the devotees had moved on towards Vrindavan. We were in Prabhupada’s room, like mid-morning, (that’s just up here Lotus building) and downstairs in the temple room there were a couple of the Bengali devotees. Swapna, and I forget the name of the other one. They were doing 24 hour kirtan. So Prabhupada was sitting back and you could hear, you know, these sounds of the holy name, beautiful and sweet, coming up in the atmosphere. Prabhupada was smiling. He said, “This is Vaikuntha.” He said, “This is actually the business in Mayapur. He said we should bring at least 500 men at a time to come to Mayapur and simply do kirtan.” So this Kirtan Mela is the fulfillment of that. As usual Prabhupada was way ahead of everybody. At that time I was thinking,’How will we get 500 men at a time to come and just do kirtan?’ So as non-believers we have to be moved at some point. The other thing is that we call it the Kirtan Mela, but again in 1976, Prabhupada met the devotees from the Radha Damodar travelling sankirtana party and he preached to them. He said, “It’s not kirtan. It is sankirtana. Kirtan is done alone, but sankirtana is done all together as a group.” So I’d like to make a humble suggestion that in future we call these the Sankirtana Mela’s and not the Kirtan Mela’s. (applause) Srila Prabhupada ki jaya! HH Kadamba Kanana Swami: Thank you very much for expanding the nectar, and making it still more rich. That is what will happen. Various Vaisnavas will speak this week and will deepen our vision and with that deeper vision we will enter deeper into chanting the holy name. Thank you very much! Harinama sankirtana yajna ki jaya!